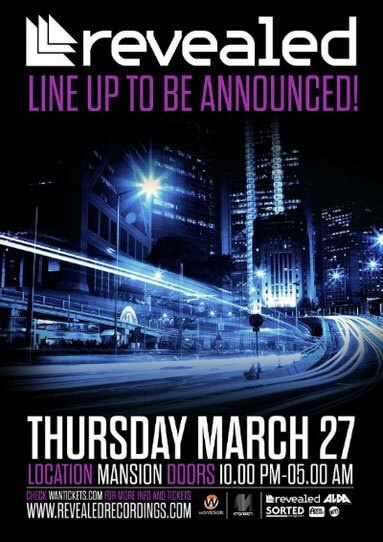 On Thursday 27 March, Dutch imprint Revealed Recordings touches down in Miami for another party at Mansion Nightclub on Washington Avenue. Featuring a line-up including Revealed artists, new talents and more, the night plans to showcase an eclectic, yet refined selection of festival anthems. After a big 2013, Hardwell’s Revealed Recordings has built a reputation as a popular electronic music brand with a strong focus on supporting and nurturing the stars of tomorrow. In a little over three years since its inception, Revealed Recordings has risen to prominence following previous sold-out label events in Las Vegas, Zurich, Amsterdam, Portrush, Antwerp and Glasgow, as well as last year’s bus tour of Canada. With future events such as April’s Revealed North American Bus Tour, the Revealed arena stage at Sundance festival in Montreux Switzerland (May 31st) and the first ever Revealed arena takeover at UK festival Creamfields, the label is now set to continue with a return to Miami for another big party. Full line up will be announced 6 March. You actually make it appear so easy together with your presentation but I to find this matter to be really one thing which I think I would by no means understand. It seems too complicated and very vast for me. I am looking ahead in your subsequent put up, I'll try to get the dangle of it! It's a pity you don't have a donate button! I'd definitely donate to this superb blog! I suppose for now i'll settle for bookmarking and adding your RSS feed to my Google account. I look forward to new updates and will share this website with my Facebook group. Chat soon!